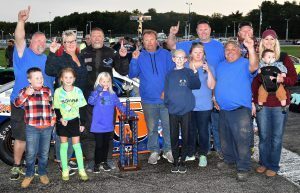 Scarborough, Maine — Gary Smith of Bangor claimed his second career Pro All Stars Series Super Late Model win, and his first-ever Beech Ridge Motor Speedway victory, in the 150-lap main event at the historic Scarborough, Maine racetrack on Sunday afternoon. Smith, 62, was ecstatic after outrunning his chassis builder, nine-time Oxford Plains Speedway champion Jeff Taylor of Farmington, to the checkered flag. The victory knocked an important entry off his bucket list. Smith joins a small list of Maine racers who have won premiere division events at all six modern-era asphalt racetracks in their home state. Scarborough, Maine – Reid Lanpher of Manchester nailed down his first Pro All Stars Series North Super Late Model victory of the season Saturday night, dominating the non-stop, 150-lap event. Lanpher, who had posted three runner-up finishes in six PASS North starts earlier this year, stalked an intense battle between Trevor Sanborn and Garrett Hall through the opening stages of the race before driving around the competition to win by almost five seconds.